From left to right: L Ward, who owns Chester-based furniture-making company ButcherShop Rehab; Devon Walls, who owns MJ Freed Theater; Laurie Zierer, executive director of the Pennsylvania Humanities Council; and Kenya Abdul, owner of vintage design shop Search+Rescue. Inside a theater one Friday afternoon in June, artist Devon Walls busily thumbs through a stack of papers, going over weekend bookings and stopping to chat with passersby who pop in from the street. On the wall behind him hangs a neat row of funky, abstract African art pieces complemented by vintage tub chairs that wouldn't look out of place in a West Elm showroom. Through a pair of glass doors off to the side, meanwhile, is a piano surrounded by a stockpile of more paintings and sculptures — all of which combine to give you the sense you've stumbled upon a great discovery. The scene feels a little like Fishtown or Northern Liberties, but this is Chester we're talking about. And not the Chester you have in mind. "When you hear so much about crime and drugs and stuff like that, this is like the yeti of the city," Walls told PhillyVoice. He owns and operates the MJ Freed Theater in downtown Chester, and he's keenly aware of the city's reputation for crime over art. "You might hear about [the city's arts] but you’d never seen it before. Most people, when they come here, they say ‘Oh, I didn’t know this was here. We hadn’t heard of this.'" But he and his consortium of artists have been there all along. It's just that no one was looking. Walls, born and raised in Chester, is a painter, sculptor, photographer, videographer, designer, maker of furniture and general rival to Leonardo DaVinci's jack-of-all-trades rep. Save for a few years he spent helping developers build up culturally starved neighborhoods in New York and Washington, D.C., through pop-up shops and art shows, Walls has mostly kept his talents local. During that tour, he realized he owed it to his hometown — his community — to give them what he'd helped give neighborhoods in those major cities: an arts district. And with it, redevelopment. Hopefully. "If you look at areas around the country — SoHo, Northern Liberties, same thing in D.C. — it’s artists that start all those transitions," Walls said. The 'Abstract Space' room of the MJ Freed Theater, located at 515 Avenue of the States in Chester, Chester County. With those examples in mind, he stepped back on the scene in Chester in 2014 and began buying up lots on the 500 Block of Avenue of the States, located downtown. 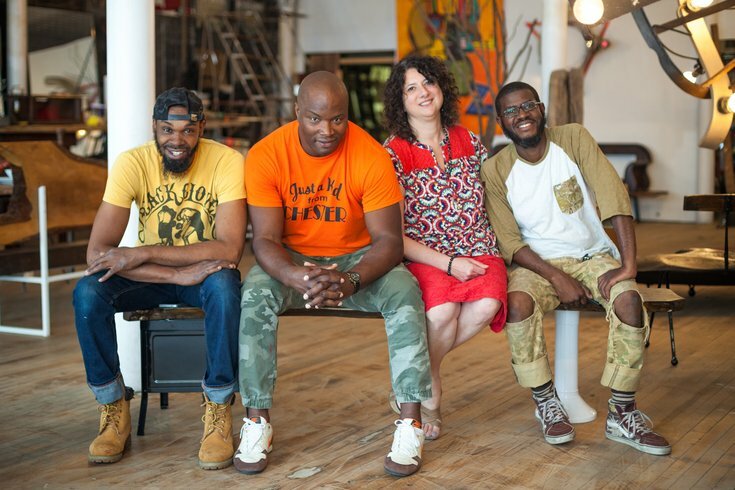 The mission: Transform them into workspaces for artists, amenities for community members. While it's not exactly a case of "mission accomplished" just yet, success thus far has been impressive. Stroll the avenue today — or drive through on your way to a soccer game, if that's your thing — and you'll find a theater, an art gallery, a showroom, an artist warehouse, a cafe, a juice bar and an in-the-works coffee shop. Those are all amenities that, Walls and others emphasize, did not exist a short two years ago — with artists and not developers paving the way. That said, the progress didn't happen overnight — and Walls had plenty of help. His journey began in a Chester artist warehouse he jokingly calls "Oz," a compound-like facility that had security cameras and no windows and was meant to keep outsiders away as artists hammered away (sometimes literally) on their projects. It was significant, then, when he met Pennsylvania Humanities Council Executive Director Laurie Zierer, who, rather serendipitously, had received a discovery grant from Pew (plus funds from PECO) for a community development project in Chester. Zierer managed to talk Walls and his cohorts out of the compound and into meetings with the city; together, they came up with an initiative titled Chester Made (think: "Temple Made"). "That was where art and politics met in a very real way," Zierer told PhillyVoice. 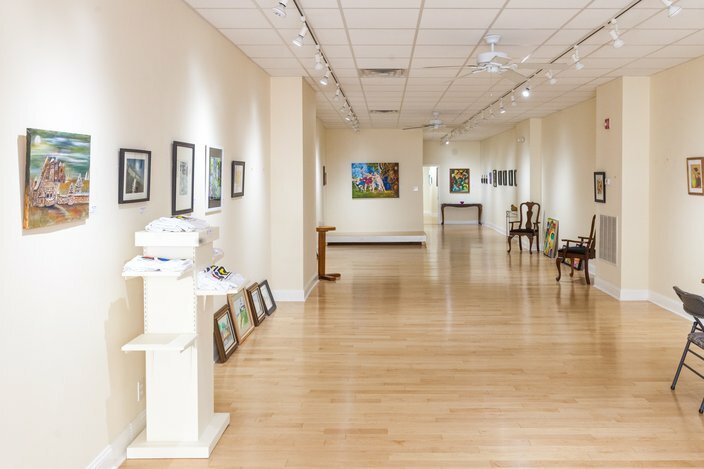 'ART on Avenue of the States' is a newly-renovated gallery space that offers collaborative monthly shows featuring a diverse range of mediums. The project involved storytelling sessions among the larger Chester community that resulted in a Cultural Asset Map, and eventually allowed the city and the Pennsylvania Humanities Council — a statewide, independent partner of the National Endowment for the Humanities — to come up with a plan that maps a cultural corridor spanning the elevated Amtrak rail line to East Fifth Street, with the 500 Block of Avenue of the States as the epicenter. After the project ended, the Chester Made slogan was adopted by the city and became the marquee for how Chester is promoting itself, highlighting the town's people, projects and products. Aside from culminating in the development of Avenue of the States as both a destination and collaborative home for artists ("It's like college, but no one is the professor," Walls quipped of the vibe), Chester Made was instrumental in nabbing the Pennsylvania Humanities Council a second grant from Pew earlier this month: a $287,500 sum that it will use to work with an archaeologist to explore a series of newly discovered tunnels beneath the city, as well as to continue to boost foot traffic in the area by working with the city's artists. 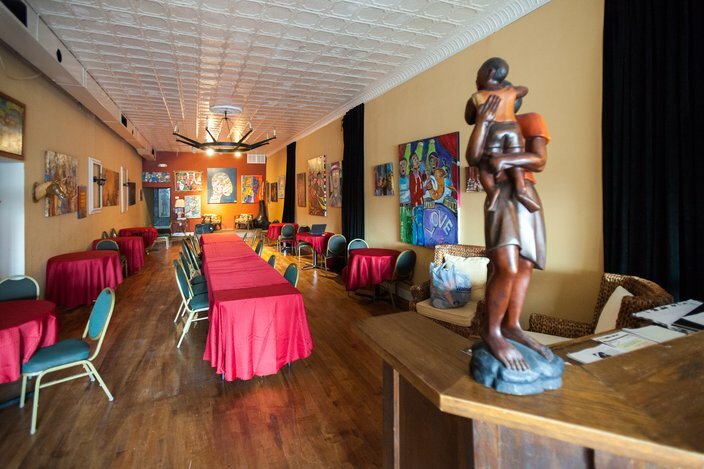 Moreover, the grant — along with funds from the NEA — will allow them to take the story of Chester's growing arts scene to Gary, Indiana, and Chicago, where the Pennsylvania Humanities Council will participate in peer exchange workshops centered around creative placemaking. "What’s happening in Chester is very special. You don’t [usually] see this happening from the grassroots; this is not a typical story," Zierer said. "We want to take this to a national level, at a much higher level to learn, but also exchange. There’s something special going on here that needs to be part of a national conversation." Looking at the 500 Block of Avenue of the States, Latifah Griffin, director of the city of Chester Planning Department, has her fingers crossed that growth won't end there. “What Devon is doing is really contagious to everyone around him, and it’s a great thing," Griffin told PhillyVoice. 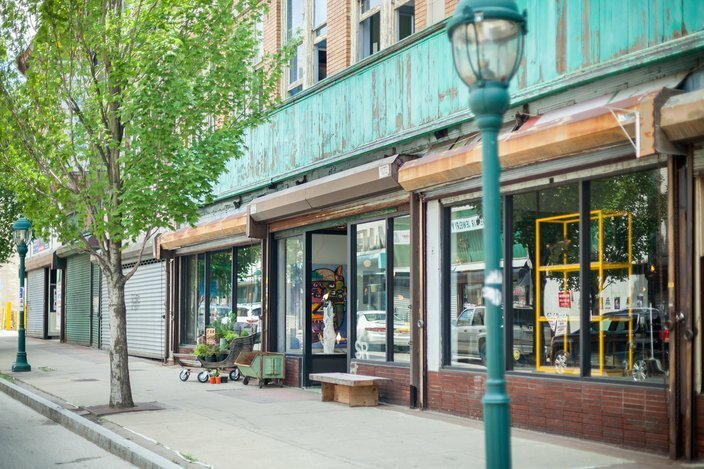 "Great for our block, our downtown and I hope people on the 600 Block and 700 Block catch the revitalization fever, to improve their businesses and make them more accessible to everyone." Zierer: What’s happening in Chester is very special. You don’t [usually] see this happening from the grassroots; this is not a typical story. The ambition to use the arts as a tool for revitalizing Chester is nothing new, Griffin said. The plan for a cultural corridor started with former Mayor John Linder shortly after the Obama Administration named Chester a "Strong Cities, Strong Communities" city. It was even written into a resolution circa 2013, a lofty ambition to also connect — in spirit, at least — downtown Chester with neighboring Widener University. To its credit, Widener has been an ongoing partner with the city and the Pennsylvania Humanities Council. Still, Griffin explained, there's long been an "invisible wall" between the two that needs to be torn down. "The students typically don’t cross the bridge. Currently, they have the Boundaries & Bridges program they’ve developed — Devon is part of that — and I think they’re doing a great job of dismantling that invisible border around the campus and acknowledging that there needs to be an invisible bridge to let folks know it's OK, that you can visit downtown," Griffin said. "There are a lot of attractive things about the city, and if you like the arts, here’s a corridor you can come down. It’s a commercial strip, Chester’s downtown. It’s not what it used to be, but it’s coming back." 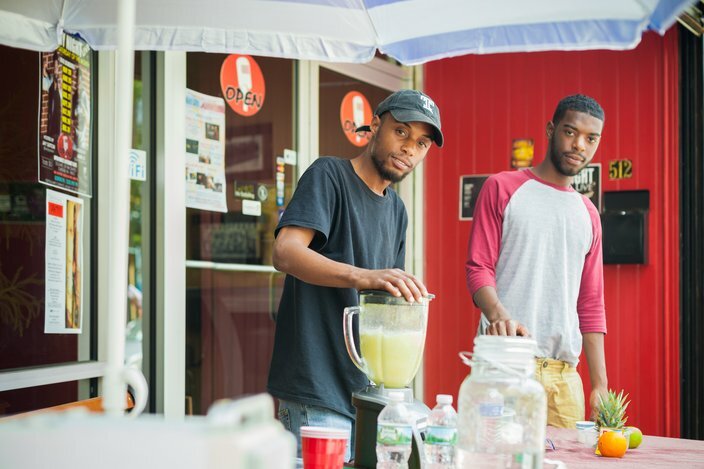 A new summertime addition to the Avenue, 'Organics,' a smoothie and juice bar run by Andell and Wendell Brown, is set up outside of Open Mike's Cafe, located at 512 Avenue of the States. Boundaries & Bridges, funded by the Barra Foundation, was established by Widener University Dean of the College of Arts & Sciences Sharon Meagher and Walls. The two organize events in downtown Chester and on Widener's campus, the idea being to use the arts to lure students to downtown Chester and vice versa. It also encourages collaboration between Widener and Chester artists, the hope being that collaboration can bridge the communities. The Widener connection is critical, Griffin said, because it brings a large and diverse new audience downtown. "You take that subset of folks, and you have easily another 5,000 [patrons]. So, you want them to come and support your businesses — you don’t want that revenue to go outside the city," Griffin said. "From a business perspective, we want the revenue in our downtown. We want their energy down here." It also, she said, goes a long way toward rebuilding the city's image. She joked that people in conferences often look at her "like I work in Baghdad" when she tells them she's from Chester. 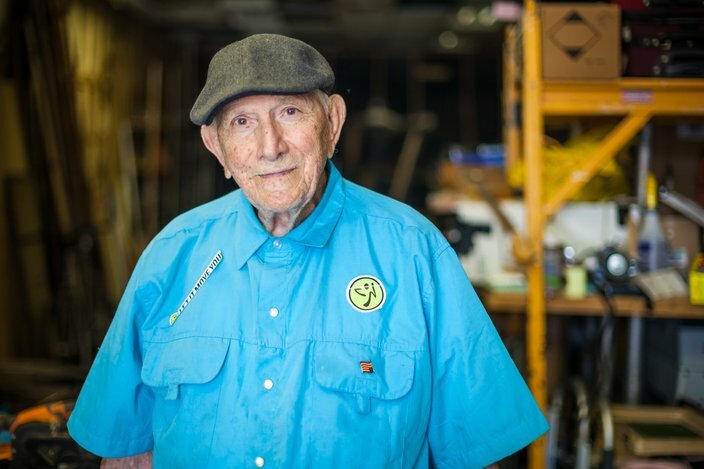 Artist and World War II veteran, 'Uncle Joe,' has been making art since the age of 14. He was given an opportunity to set up a small studio on the Avenue of the States next to the 'Abstract Space,' where he mainly creates vacuum-molded thermal plastic forms. "They have a negative perception that this place is downtrodden and bad. But unfortunately, that's what the media picks up. They don’t pick up the good stuff," she said. "We have to call them to pick that up. We don’t have to call when there’s a crime occurring." The end goal, then, is twofold: mend the city's image, and develop a model for future success stories in the city. "The ideal scenario, from a planning perspective, is to complete the Pew project, get the 500 Block activated as a creative exploration zone and really to model — to let that be a model for other areas in the city," she said. "It doesn’t have to be exclusive to downtown." It's no surprise that Walls and co. are using the arts to redevelop downtown Chester. In fact, it's a more common approach to redevelopment than you'd think. “It’s the best-kept secret everybody knows," Randall Mason, associate professor of city & regional planning at the University of Pennsylvania, told PhillyVoice. "Common wisdom now is you’re not going to be able to attract young talent to a place that doesn’t have amenities — tick them [on] off your hand. Why are you here? 'It’s a great music scene, food scene, art scene, you can bicycle everywhere, etc.' All those manifestations of ‘cool’ arts culture, those are what most corporations and universities use as their main attractors. "You'd be hard-pressed to find a city where this has not been implemented or attempted." The showroom for furniture-maker Butcher Shop Rehab, a company that creates pieces for design stores like West Elm and Urban Outfitters. However, Mason added that it's more common that community development corporations or arts organizations orchestrate a plan for an arts district. When artists organically emerge in cities like Chester, it's often because of the low cost of living. But because these artists are then able to afford to produce goods in these areas, they grow over time into what he calls a "consumption district." Or, in other words, open a gallery or showroom, and next thing you know, a cafe's sprung up down the street. There's also the factor of identity, he said; the arts tend to inherently add value to spaces that have deteriorated over time. "They might not bring [identity] themselves, but they attract it," he said. "It does change the identity of an area by simply saying, 'These buildings are valuable to us.’ So let’s say they give us a place to practice our art, exhibit our art or perform what we want to perform. In academia, we call it 'revalorization' — to breathe new life into it, demonstrate that it has value." And if its current pace of growth is any indication, value on Avenue of the States abounds. As a kid, Walls remembers his late uncle, also an artist, relaying stories of sit-ins in the 1950s and '60s on the very block he's now taken up residence in — fighting just to have a space to work out of or even patronize safely, let alone showcase his art in. For Walls to own land on that strip of Avenue of the States today, then, would have been unimaginable not that long ago. “I said to him and my mom, ‘One day, we’re going to own that block,'" Walls said. "And that's my biggest motivation: To change it so the artists can really do the work they need to do, so we can sit down and talk to reporters about the work being done. I can truly say it didn’t start with me and probably won’t end with me — this is way bigger than just Devon trying to build something. I’m building something off the back of some people who’ve struggled, died or been incarcerated for it. So, what's next? While Walls focuses on building arts programming and adding residences atop storefronts on the avenue, Zierer said she's continuing to leverage the newly carved-out downtown arts district — an "exploration zone," she calls it — as a way to build identity and show people that Chester isn't as frightening as its reputation suggests. That ultimately, transforming Chester's downtown into a bustling commercial corridor is as simple as going there and seeing it for yourself. Case in point: Zierer recalled traveling with a group on a bus to Avenue of the States. When the bus stopped, everyone looked around, inside the bus, confused — as if Google Maps had set the wrong destination. That fear, she said, is the biggest obstacle to change. "If you really want to make [a] change, you've gotta get in there and do it," she remarked. "You have to get off the bus."